Happy 2014, y’all! I hope that your 2014 is off to a fantastic start, + that it’s a fabulous, wonderful year for all of you. I know many people make food- and diet-related resolutions in the new year, so I’m starting off the year with a healthy, meat-free twist on the classic pasta bolognese. In this recipe, instead of beef, pork, or veal, I use crumbled tofu as the “meat.” And while I used traditional pasta here, if you’re eating low-carb, you can easily substitute spaghetti squash for the pasta. The tofu gets sauteed until golden brown with caramelized onions, garlic, carrots, + celery, then slowly simmers with tomato paste, crushed tomatoes, broth, + herbs. 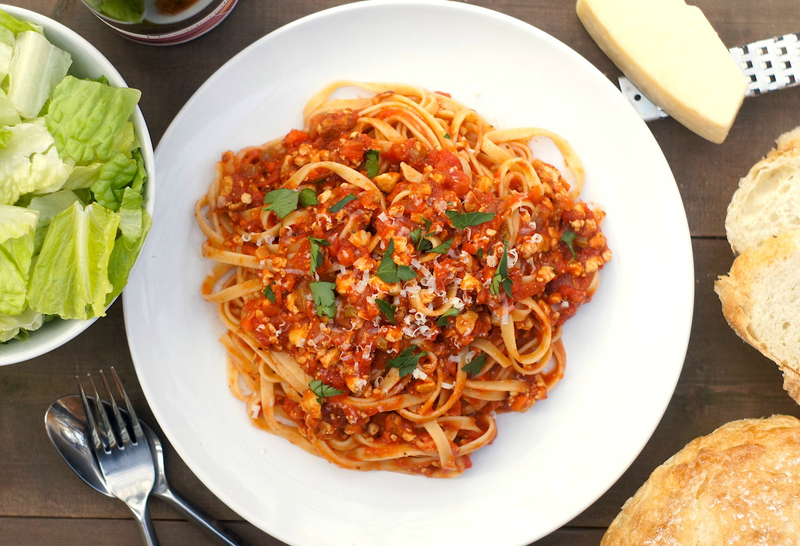 The result is a wonderfully flavorful meat-free bolognese sauce that is so delicious, you truly won’t miss the meat! The crumbled tofu has a perfect slightly-chewy texture, which makes it a satisfying substitute for meat. My meat-loving husband, who tolerates tofu but doesn’t love it, was a huge fan of this meal, going back for seconds. And I was an even bigger fan – I had a huge portion the first night I made it, and loved it as leftovers – the flavors got even more delicious and complex after sitting overnight in the fridge. So, if one of your New Year’s goals is to eat healthier, or to eat less meat, you must give this delicious meal a try! 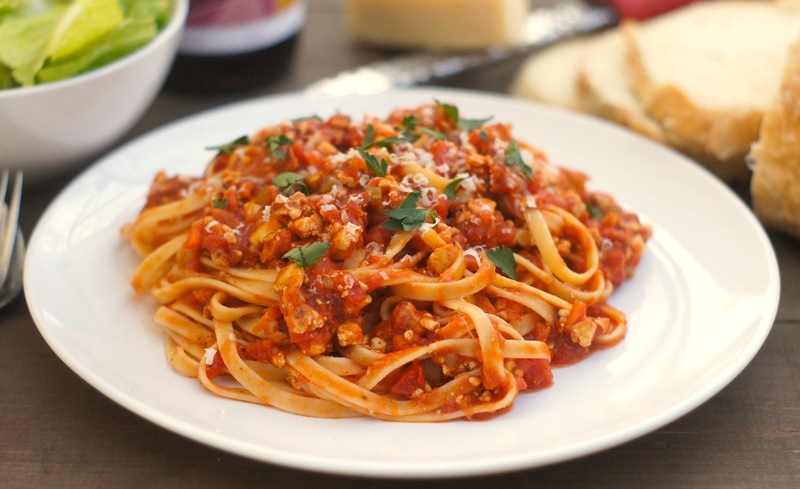 And even if it that isn’t one of your resolutions, you should still put this tofu “bolognese” on your to-try list — it’ll be a crowd-pleaser for both meat-eaters AND vegetarians! First, prepare the tofu. Press the tofu blocks between paper towels to remove as much moisture as possible. Then, using your hands, crumble into smaller pieces. Don’t worry about making them super small – you’ll crumble them further during the cooking process. Set crumbled tofu aside. In a large skillet, heat olive oil over medium heat, then add in the onion, carrots, and celery. Saute for 10-15 minutes, until onions are translucent and vegetables are softened. Add in the garlic and saute for 1-2 minutes, until garlic is fragrant. Add salt and pepper to taste. Add the crumbled tofu and Italian seasoning to the pan and raise the heat to medium-high. Cook for about 30 minutes, breaking up the tofu into smaller pieces with a wooden spoon or spatula, stirring every 3-5 minutes. The tofu will gradually turn golden brown – be patient, as it takes some time! The less you fuss with it (especially in the first few minutes), the better the tofu will brown. After about 30 minutes, once the tofu is broken down into ground meat-size pieces and golden brown, add the tomato paste. Saute for 3 minutes, stirring constantly to get everything well-combined. Then, add in the crushed tomatoes, bay leaves, red pepper, vegetable or chicken broth, and salt and pepper to taste. Simmer for 15-20 minutes. Meanwhile, bring a large pot of salted water to a boil. Cook the pasta according to the package directions, until al dente. Reserve 1/2 cup of the cooking liquid, and drain pasta. Add the pasta to the skillet with the sauce and toss to combine well, adding some of the cooking liquid if needed to achieve your desired consistency. Serve immediately, topped with vegetarian cheese and parsley, if desired. This is such a neat dish! Love it! I would love to try this – I wonder if hubby and the kids would notice the difference. saving this recipe..i love bolognese but using tofu will be such a healthy substitute. thank you. That is one gorgeous plate of pasta! I like your spin on a meat-free dish! I LOVED this. And now I’m craving it for breakfast. Thanks for sharing the recipe. It was stupendously delicious. We’re surviving the cold so far, thanks! =) You’ll have to let me know what fun tofu-centered recipes you come up with. I love tofu, but I almost always make it the same way – cubed, sauteed, with ginger/honey/soy. I’m trying to branch out and use tofu in new, creative ways. We’ll have to compare notes on the recipes we try! What an interesting dish! I confess to an utter lack of familiarity with tofu, but I bet that the tofu soaks up the flavor of the ragu and winds up being really tasty. What a great idea! Happy New Year to you and best wishes for happy, healthy eating! This definitely looks delicious. But I might halve the recipe because this could feed an army! It looks delicious! And even though I didn’t make any resolutions, I always try especially hard to eat well in January. this sounds so interesting! I’ve never tried using tofu in this way but it sounds really tasty and just full of flavour. You always make me swoon with your perfect plates of pasta!!! This sauce looks really creative and interesting! We try to eat a couple meat-free dinners each week. very original, Ms. Fearless Homemaker Amy! I like this idea, because I like tofu! Now why didn’t I think of this before? Looks delicious! I could eat a big plate of that right now! My sauce came out looking just like the picture. HOWEVER…the “browning” of the tofu basically meant burning it, and it didn’t add any flavor. I had to double the herbs and double the garlic, and add a little sugar to combat the bitterness of crushed tomatoes (and I usually don’t have a heavy hand with herbs or garlic). I finally came out tasting ok for a meatless bolognese, however, the tofu added nothing but tasteless protein (and not much, at that). Won’t be making again, would rather have a veggie bolognese and a greek yogurt for dessert…more protein, more yummy. Hi Sophie, So sorry that this dish didn’t turn out well for you. Hopefully you’ll find another recipe on my blog that you like better! AAArgggg! I hope you don’t serve this to vegetarians if you make it with the chicken broth alternative!!!! Hi Elaine, I would personally only use vegetable broth if serving this to vegetarians, but I do have some friends who consider themselves vegetarian and still consume chicken broth. So I’ll leave that up to the discretion of the particular vegetarian. I did add a note to the ingredient list about it, though – thanks for pointing it out. I used half the tomatoes and half the tofu, skipped the tomato paste, and added a bag of spinach to the pasta for the last minute of boiling. It easily served four generously, and it was fabulous. Served with grated cheese…..yum, will make this again, it is a winner! I’m so thrilled you liked it, Helga, and I love your addition of spinach. YUM! I made this the other night for my 1 year olds triplets. They all loved it. One of them was refusing all food because she was sick, but she couldn’t get enough of this dish! I had the leftovers myself for lunch today…delicious! I haven’t eaten tofu before, but I would definitely make this again! Bookmarking and sharing this recipe! Great recipe. Thanks for sharing. However, should be noted that Parmesan contains animal rennet (Enzyme from calf intestine), and is not considered a suitable ingredient for a large number of vegeterians. Parmesan is an EU Protected Designation of Origin Product and will always contain animal rennet. Alternatives are available and it would be worth highlighting truly vegeterian options in the ingredient list. The list of animal content in every day products is both staggering and confusing. I hope this helps in some small way. Thanks again for the recipe. Thanks for the comment, Jonathan! I actually now know that some cheeses contain animal rennet vs. vegetarian rennet (and some cheeses can never be vegetarian) but I didn’t know that when I wrote this post over a year ago. I will definitely add a comment about that now – thanks for the suggestion, because I honestly wouldn’t have thought to look back at this recipe to check. Luckily, the parmesan in this recipe is simply a topping/garnish and can easily be omitted – it certainly isn’t a necessary/crucial ingredient. Thanks again for popping by with your comment – much appreciated. PS, Jonathan – if you have a suggestion for a cheese that would be good to top this with, that is vegetarian, I’d love to hear it so I can update the recipe! Can you make the sauce a day ahead then heat it up the next night? Or will the tofu get mushy? You can definitely make it a day ahead, Sally. I actually loved it leftover! Someone brought this to a potluck at work. She used green peppers in place of the onions and she replaced the linguini with bow tie pasta. I didn’t know she used tofu instead of meat. I couldn’t tell the difference. It was delicious. I can’t wait to make this. I am so thrilled to hear that! Hope you love it just as much when you make it yourself, too. And thanks so much for popping by to share – comments like this make my day! Omg, I made this for dinner for my mom and me tonight – it was totally delicious and a smashing success!! My mom LOVED it, and so do I. This is my go-to red sauce for pasta from now on! Thank you!!! This sounds great. You suggest to serve immediately. Does this store well? I want to offer my vegetarian friends a spaghetti option on a camp trip, so it will need to store for up to 3 days (in the fridge, of coarse). Yes, it does store well in the fridge and reheats nicely, Shannon. Last time I made it, I made a huge batch and ate it as leftover lunches for the week, and it was fantastic reheated. I hope your friends love it on the camp trip! Late to the vegan plate. I don’t know if Gardein was available in 2014, but I’m using Gardein ultimate ground meatless meat, which is tried and true, and very excited about it. I know this will be a favorite dish in my house. Previous post: The most popular posts of 2013!